Here at W4G Security, we pride ourselves on delivering professional security services in Devon and London; and as a reputable and successful security company, we know the importance of safety within the workplace. Recently one of our Devon Security Guards prevented an almost devastating incident and prevented the loss of several lives. All our Security guards, whether they are working within the Construction sector, as Close Protection officers in London or providing Security at a festival or event, know the importance of putting safety first. This was shown during a recent task in which we received a Letter of Appreciation from our client based in Falmouth Docks. The letter was sent to us from Nickolas.K.Hardy, the Chief Mate from the USNS Bruce C. Heezen survey ship, where we were providing manned security services. During a night shift one of our highly-trained security guards, Ian Smith, noticed an unusual smell and began to investigate. He started a foot patrol when a member of the crew ran to him and explained he had seen white smoke approaching from a neighbouring ship. At this point, Ian took control of the situation and using his initiative by raising an alarm to alert colleagues and crew straight away. He contacted the dock police and had the service team shut down the faulty generators on the neighbouring ship. The crew were evacuated immediately. It was discovered that one of the diesel generators which was supplying the neighbouring ship had malfunctioned. 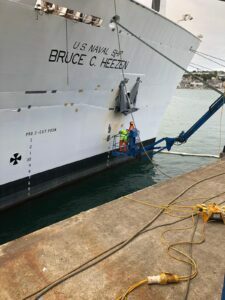 The generator was spewing large amounts of toxic exhaust directly into the fresh air intakes of the USNS Bruce C Heezen where the majority of crew were sleeping. As stated by the Chief Mate in the letter of appreciation, without the quick-thinking and actions of our Security Officer, Ian, this incident could have resulted in the loss of several lives. A quote from the letter written by Chief Mate Nikolas.K.Hardy, said: “Mr. Smith quickly made a phone call to the appropriate authorities as to the condition of the generator and have the service people shut it down and correct the problem. Incidents like these are the reasons why we look for experienced and well-trained Security Officers, who will go that extra mile to provide Security whilst knowing the importance of Safety and Customer Service within any workplace environment. 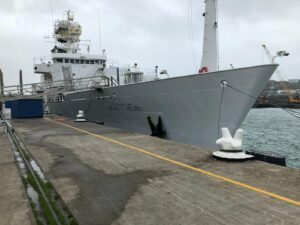 We would like to take this opportunity to thank our Security Officers – Nick Athier and Ian John Smith on the great work they have done, providing security for USNS Bruce C.Heezen during its time at Falmouth Docks. Both officers went the extra mile to provide a safe environment and excellent customer service, which W4G Security has built its foundation on. If you would like to find out more about our professional security guard services in Devon or London, please do not hesitate to get in touch with us through our contact page and we will be happy to discuss your bespoke security requirements further.